One of the latest features Facebook has rolled out is Cover Videos. We can see some great examples of pages like Netflix’s Narcos, Fusion Guitars and Hager Group where instead of a still image cover on the page, we can have a video instead. Many of us might feel that Cover Videos are out of our reach – the time and effort to design and edit a video feels overwhelming especially if we don’t have any video footage or expensive video editing software. However, you can create really simple video cover images using free tools online, and, even better, you can do it all in about ten minutes. Here’s how. What are the requirements for a Cover Video? Cover videos should be 20 – 90 seconds. Cover videos recommended size is 820 x 462 pixels. What free tools can we use to create a Video Cover? To create a Video Cover, we do need two things: video footage, and a tool to resize our video to Facebook’s specifications. Luckily for us, there are free tools that already exist online to do this. If you don’t have video assets already, there are plenty of free, creative commons stock video sites online. You don’t want to end up in hot water by using videos which belong to someone else, so using creative commons videos is a great alternative to copyrighted content. My favourite site is Pixabay, with stock videos which look pretty ace. You might be familiar with Pixabay for amazing stock photos, but they also have videos and animations too. Without additional editing software, your cover video will not have any additional branding like your logo. So: ensure it represents your business. Secondly, Facebook’s cover videos need to be a minimum of twenty seconds – make sure the video you choose is at least 20 seconds. The one I chose happened to be 35 seconds. Perfect! Finally, remember that Facebook Cover Videos are long and thin, whereas most videos online are designed for in more of a boxy rectangle of 16:9. When selecting your video, remember that only a thin section will be seen, such as the top, middle or bottom – not the whole thing. When you select the video to download, you choose what size you want. Make sure you download anything bigger than 820 x 462 pixels. Because we’re not doing anything whizbang with editing software, all we need to do is resize these videos to be the right size that Facebook needs. Remember that the video size needs to be at least 820 x 462 pixels for Facebook to accept it. 2018 update: There is a startup called Kapwing that resizes videos to size for Facebook Covers, Instagram stories and more. Check ’em out here. Just upload your video and export to the Facebook Cover specs. Done! Now your video should meet Facebook’s requirements: it is at least 20 seconds long, and has a size of at least 820 x 462 pixels. All you need to do is switch your Cover Image for a Cover Video. If you’ve not done this before, ensure you’re signed into Business Manager if needed, then hover of the top left-hand corner of your cover image. You’ll see a dropdown menu giving you the option to upload a photo or video. Upload the video, and drag it on the screen so it sits nicely within the frame, and then hit save. And that’s it! You’ve created a Facebook Cover Video, using free, creative commons videos, edited and uploaded in a few minutes. You can see my new Facebook Cover video in action here. Do you have any other tips or tricks to create simple Facebook Cover Videos? Let me know in the comments! 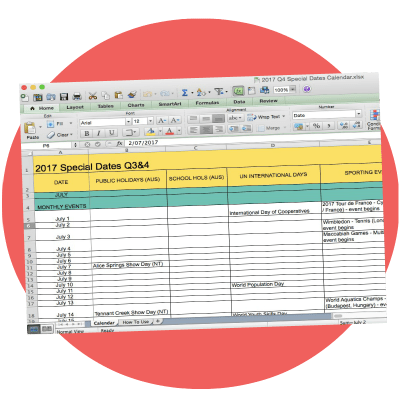 Looking for a listing of key dates, fun events and holidays to help you plan your social media content for 2018? This dates listing covers everything from Australian public holidays, silly days, sporting events and award shows from January through til December 2018. Great tutorial to create video cover for facebook, I will try it and many thanks for you…. I tried to upload the video from Px to EXgif but they would not accept the MP4 to resize. Did I miss a step where we should reformat the video? Hi there, I found I could use EZgif to crop MP4s without issue, but there are a few sections to the site. Are you sure you’re looking at the video cropping section, not the gif cropping section? I recently found another site called Kapwing that also crops the video and it’s a bit easier to navigate than EZgif. It might be an alternative to try!